Better Life Blog: what would you have left tomorrow? It's Thanksgiving. 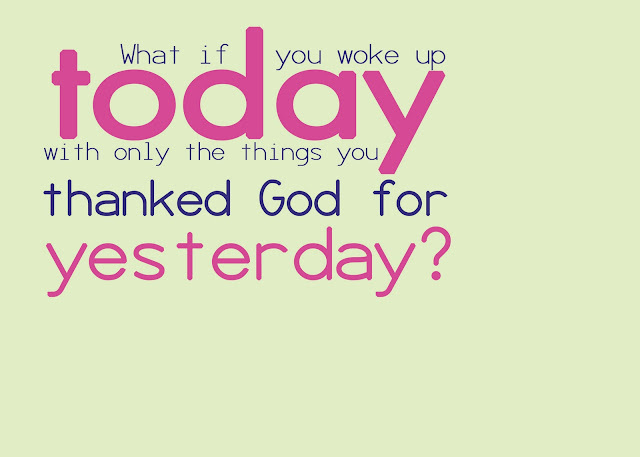 The day we all give thanks. I'm not very good at giving thanks. Are you? I pinned this quote on Pinterest awhile back and it continues to haunt me every day. Am I giving enough thanks? Even when life is HARD? And the kids are whiny? And someone vandalizes my house? Or breaks into my car? Thanks is hard. There has been a huge trend towards Ann Voskamp's One Thousand Gifts. Basically she encourages everyone to start writing down the simple everyday things we are thankful for each day. And make it a goal to reach 1000 entries. I quit after just two weeks. I guess I'm not very good at giving thanks. That is - until she came out with an iPhone app! 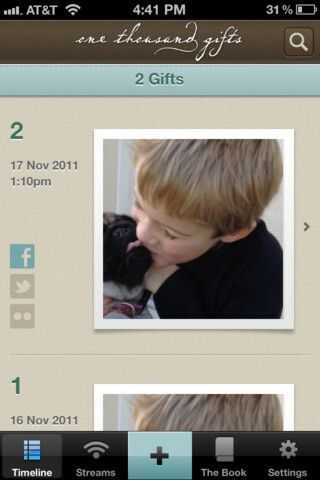 I can log my 1000 gifts with a picture and a caption. Now THIS is right up my alley. I love pictures and I love documenting life and memories. And I LOVE my iPhone. Now I can add my thankfulness in the midst of it all. It is my end of the year goal to have this be the last waking thing I do every day. Fall asleep while logging my thankfulness. It should make for a great end of year. Join me? Download the app here. we love this book over at FancyLittleThings.com -- -this past month we read the book together as authors and posted snippets from our lists and allowed others to share. i am a pen/paper kinda girl - so list making works great... off to share your post about the app. so sweet girl!